Two former ISR postdoctoral researchers recently received awards from the International Association of Advanced Materials (IAAM). 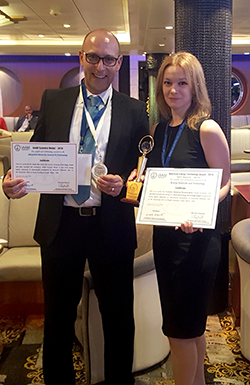 Ekaterina Pomerantseva received the 2016 American Energy Technology Award in recognition of outstanding contributions in energy materials and technology. Hadar Ben-Yoav received the 2016 IAAM Scientist Medal in recognition of outstanding contributions in advanced materials science and technology. The awards were presented, and the two presented their research at the American Advanced Materials Congress (AAMC). Both Pomerantseva and Ben-Yoav worked in ISR Director Reza Ghodssi’s MEMS Sensors and Actuators Lab as postdoctoral researchers. Today, Pomerantseva is an assistant professor in the Department of Materials Science and Engineering at Drexel University in Philadelphia. Ben-Yoav is a Senior Lecturer (Assistant Professor) in the Biomedical Engineering Department at Ben Gurion University of the Negev in Israel.